South Korean boyband BTS' highly anticipated new album Map of the Soul: Persona will feature collaborations with Ed Sheeran and Halsey. 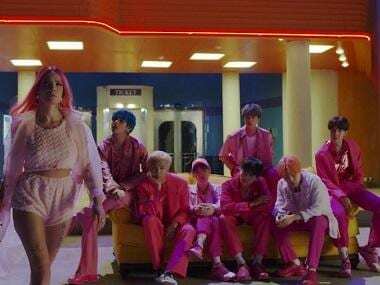 The band recently dropped a teaser of the song with Halsey titled 'Boy With Luv.' The video shows them dancing in a diner and on a brightly lit up stage. Halsey does not appear in the second teaser but she is present in the video. In the first teaser, released on 8 April, she is seen in a pink outfit and bright orange wig, locking up a ticket office of a movie theatre. She walks right past RM, Jin, Suga, J-Hope, V, Jimin, and Jungkook, who are sitting silently on a bright yellow couch, fully dressed in pink. Halsey also tweeted about the song and told her fans that she could not wait for them to see a different side to her music and persona. The single with Sheeran is titled 'Make it Right' and the band had hinted at the song in December, 2018. According to Consequence of Sound, Map of the Soul: Persona has been described as "a nod to the band’s past while showcasing their maturity and newfound understanding of love and the ever-widening world around them. The tracks have a clear message: finding joy in love and reaching out to the world." 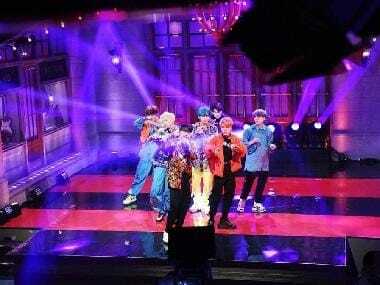 BTS will also make their Saturday Night Live debut in an episode hosted by Emma Stone. Map of the Soul: Persona releases on 12 April.